Do you know that feeling you get when you‘re having friends come over for a visit? Especially those who live a long way off and only show up once in a while? That’s the feeling we had when we welcomed Alexander Vasin and Natalia Velchinskaya, graphic designers and teachers from Moscow, to Labora once again. 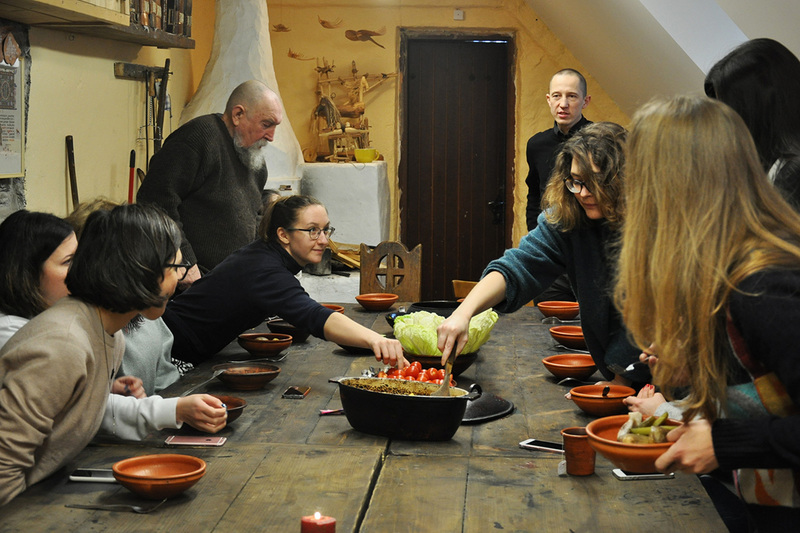 They visited our workshops with a larger group of graphic designers to help immerse them in the pre-digital-handmade world of letterpress, calligraphy and papermaking. Papermaking was one of the first things on their list. Two at a time, the workshop participants went down to our papermaking workshop to make paper from scratch. They tore up cotton linters and watched them get processed into a thick pulp in our Hollander beater. They then used moulds and deckles to form A3-sized sheets of paper that they would soon use to create small books. But before they could do that, they pressed the water out of their wet paper sheets and then hung them up to dry. Two days later, they took their dry sheets down – ready to print their designs on them. In the meantime, the programme was chock full of creative exercises. 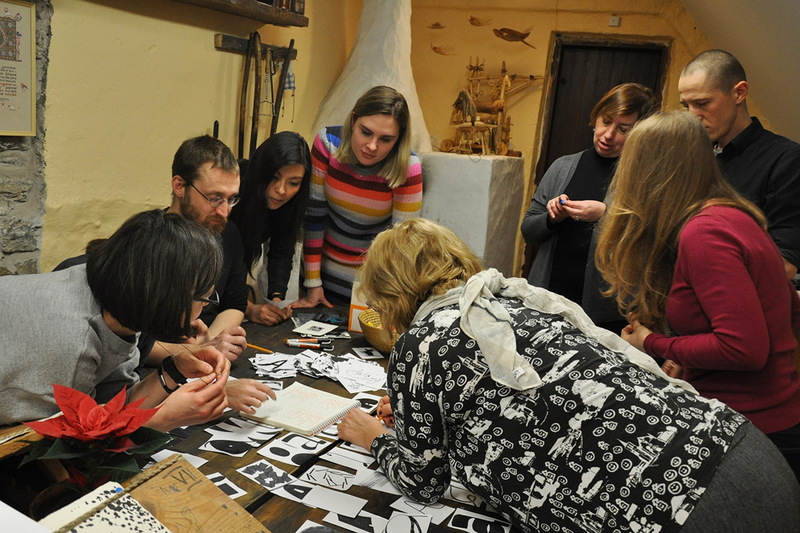 Alexander and Natalia encouraged workshop participants to push the boundries of their imagination and explore everyday objects beyond their usual forms or depictions. Try it out for yourself – how many different ways can you draw a simple cat or a house? Typography was the central theme of the course. First, Tatiana led the designers further back into history to explore the world of calligraphy. She taught everyone the italic script because of its simple form and legibitily. 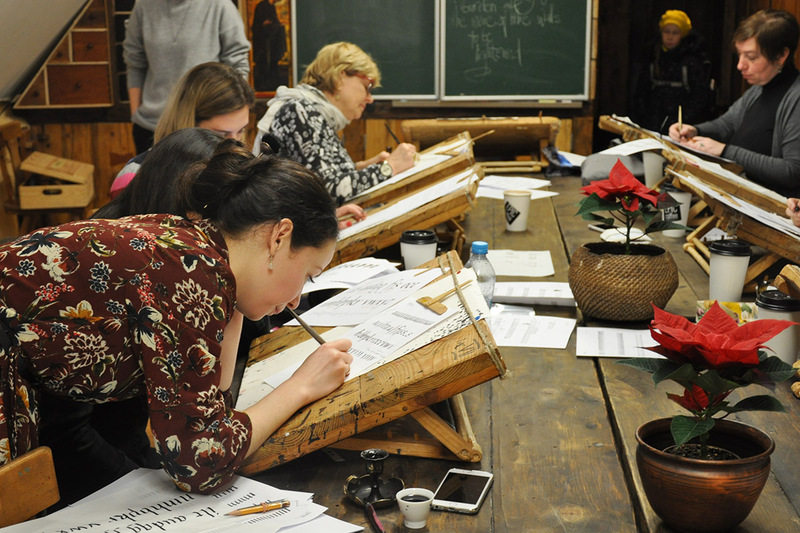 Using a simple wide-edge nib pen, the participants copied letters and grouped them into words while observing the script’s regular rythm and form. The following day, they stepped beyond the strict historic rules of the italic script and started experimenting using a variety of tools, playing with the proportions and shapes of different letters. 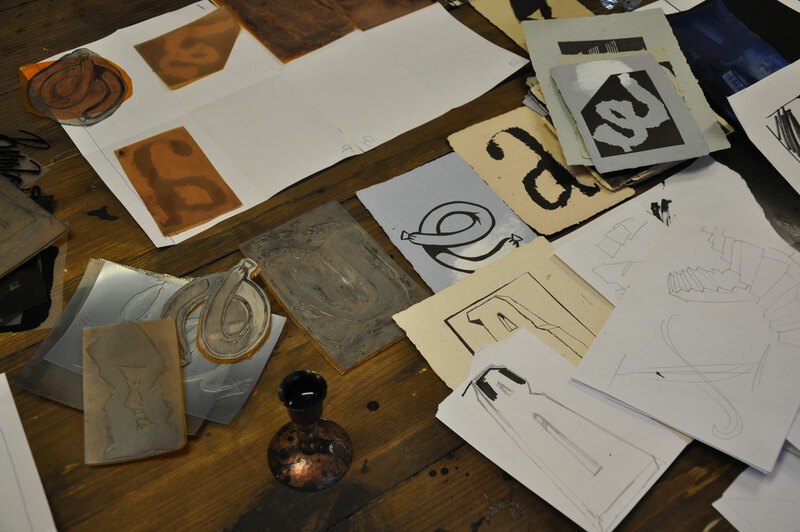 Our letterpress workshop was open at all times, with various type sets layed out on the table next to our table-top proof press. Workshop participants were welcome to drop in at any time to print whatever they wanted. They made everything from interesting business cards to abstract compositions created out of letters. When we introduced them to photopolymer plates, we broke with strict historic boundries. Drawings and abstract shapes now accompanied classically formed letters, interacting in unexpected ways. Our days of creative exploration were focused on creating a book of letters. Each person was assigned several letters along with various words starting with that same letter. Their first task was to shape letters to express words. When favourites were chosen by the group, another designer was given a letter she did not draw herself and to add an illustration to compliment it. 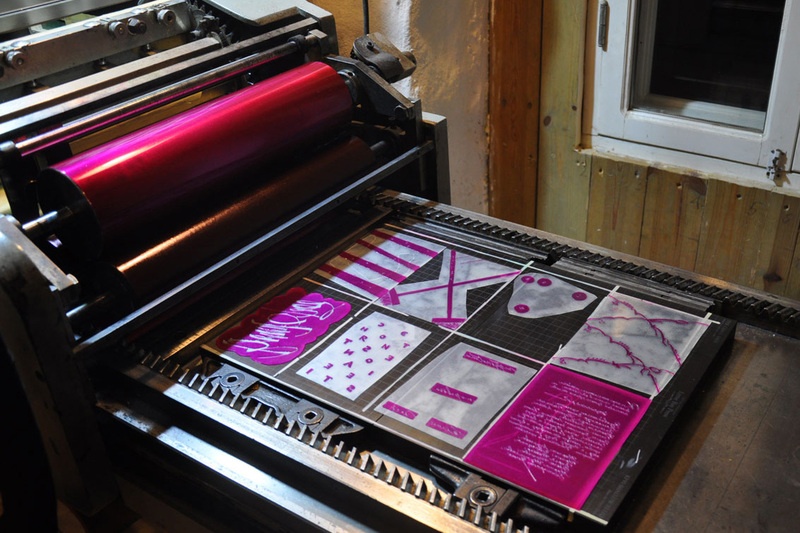 That is how the second design layer – printed in rhodamine red – came into existence. 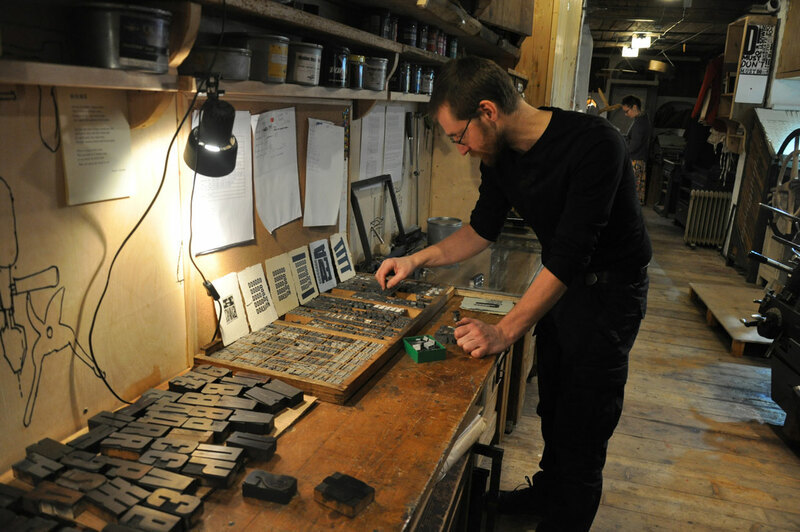 During the workshop, the designers were taken through the process of letterpress printing from beginning to end. Everyone created their own individual as well as collective designs – no computers were involved in the process, which was a welcome change for all of them! Using their own hands, a variety of different tools, inks, and foil, the participants explored a wide variety of possibilities for drawing lines and forms. Each tool made it possible for different patterns and textures to appear, a number of them only fully visible when developed into a photopolymer plate! Hannah and Nestor helped out throughout the entire printing process – from setting up the photopolymer plates on the Korrex Nürnberg press and to using them to print on the handmade paper that they participants had made earlier. Our final afternoon was spent carefully tearing the A3 sheets down to A5 size in order to assemble and then quickly bind the prints into books using a simple band. Each participant got to keep two copies for themselves. The original photopolymer plates were then re-used to make even more prints in a variety of sizes. Their organic shapes and structures inspired a variety of different prints, each one an original. Participants spent the rest of the last day assembling paper sculptures. In return for the paper kindly provided by Zelluloos, workshop participants made and installed a quirky exhibition of hanging sculptures on the premises of Zelluloos‘ shop. After leaving something behind and taking so much more back home with them, the designers finished up their busy week – but not before promising to visit us again!